The Yellow Daylily Plant has lemony-yellow blooms that are 4" in diameter. The trumpet-shaped flower blooms in May and June. Six big petals open wide and give off a sweet fragrance. The flower sits on a scape almost 3' tall above the clump of medium-green strap-shaped leaves. The flower blooms for one day, then wilts. Other blossoms will open the next day. 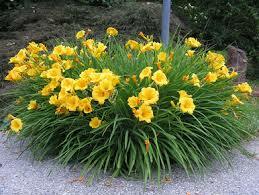 Yellow Daylily plants are very hardy and adaptable. They grow in well-drained, average soil. These plants love full sun but can tolerate shade well, too. Summer heat, poor soil and high humidity will not kill the plants. They are easy to grow, and they multiply quickly. Gardeners love the hardiness of the Yellow Daylily and use it for ground cover. These plants will also crowd out weeds. The leaves provide contrast and color even when the plant is not in bloom. Plant the Yellow Daylily in clumps along borders for a beautiful, yellow show in summer. Deadhead the plants and remove the scapes after the flowers have finished blooming for a neat appearance. As the plants multiply, divide them in the fall for the best growth and flowers next year. 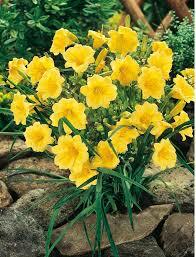 The Yellow Daylily is an adaptable flower that takes readily to different soil types. The yellow flower that is produced does have a slight fragrant odor to it, and it can range in many different color yellows. The Yellow Daylily flowers are an absolute foolproof plant, and they are very easy to take care of. Once they are placed in the soil, they will bloom even in the hardest types of soils like the clay or soils that don’t get a lot of water. 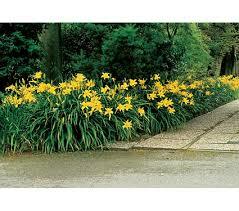 The bulbs can be planted and will rapidly spread and multiply over time. They can easily be dug up or broke apart at the base and replanted in other places and areas. They look good when grown around a deck, natural area with different plants this size or groundcovers because of the distinct height difference.